The Last Sunday in May, (C&O Canal Georgetown) 12x16 oil on panel. 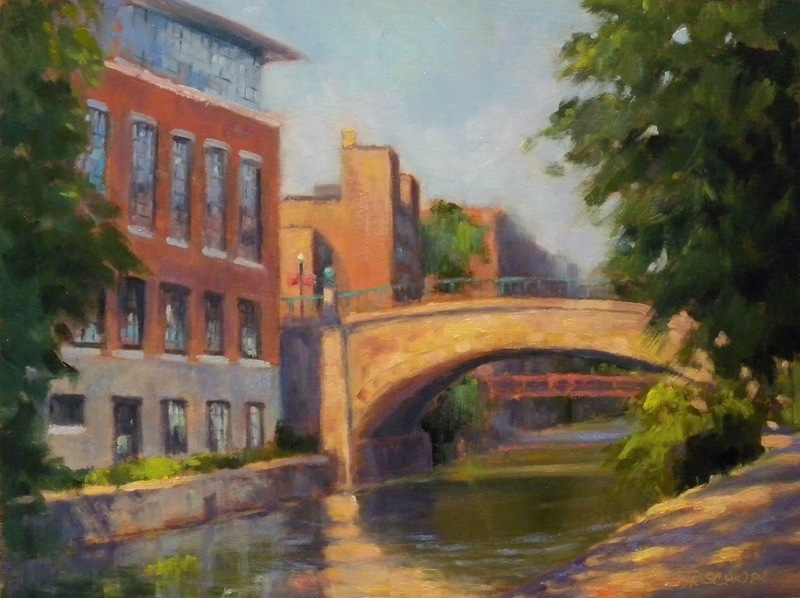 Another summer memory is that of painting along the C&O Canal in Georgetown on May 31st. This was a joint paintout of the Washington Society of Landscape Painters and the Mid Atlantic Plein Air Painters. Artists were scattered throughout Georgetown and it was fun to meet some new artists and gather with some of them for a critique of the morning's work. I selected this spot along the canal between 31st and 30th streets and it turned out to be a good choice because as I was setting up my French easel one of the screws attaching a leg could not be tightened. Fortunately for me just to the right of this view is a waist high stone wall. I was able to fold the legs and set up as a table easel. I spent some of the time standing and some sitting next to it on the wall. It worked fine. Just beyond the stone wall was the balcony for the Sea Catch restaurant filled with patrons enjoying the fine morning. I had an appreciative audience :) However, I must say I was starving by the time I finished and was tempted to skip the critique and join the diners on the balcony for a hearty lunch! It has been a long and wonderful summer and I hate to see the end of it. I guess I haven't blogged since June and I can tell you it is because I would very much prefer spending my time outdoors enjoying the balmy weather rather than behind the computer blogging. That is not to say there haven't been a number of paintings produced this summer and I would now like to start sharing some of them with you. Since fall always brings small works exhibits I like to produce some tiny paintings during the summer months in preparation. 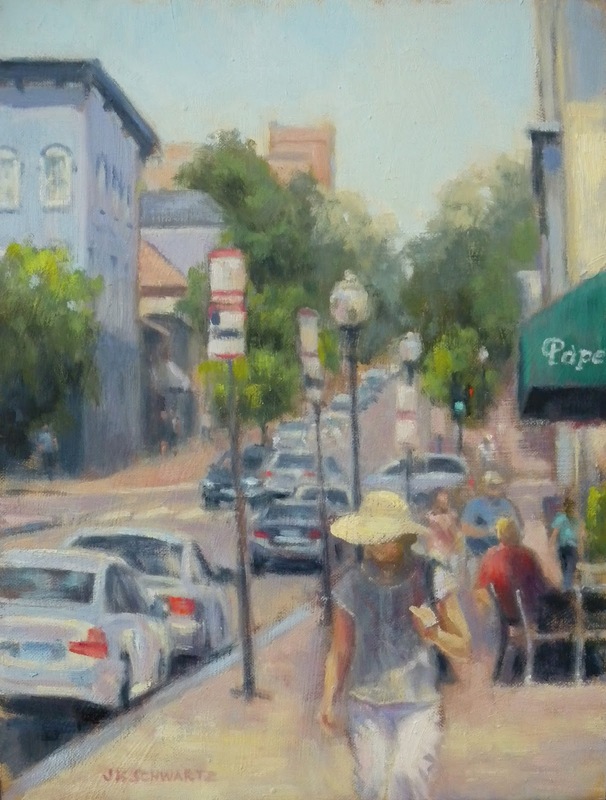 Also, it is convenient to work small when painting en plein air. The two paintings above will be exhibited later this fall at American Paintings Fine Art here in DC and I will say more about that in a future post. 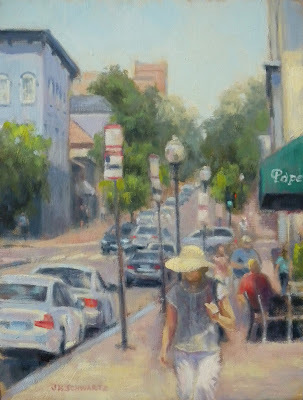 The painting at the top of the page was produced from a ballpoint sketch produced on site and the second painting was roughed in on site because I had just completed another painting in Georgetown along the canal and one of the legs on my easel broke. However, I couldn't resist this sunny scene. I did a rough sketch with burnt sienna and ultramarine blue on the small panel, took a couple of photos and completed it in the studio. ON EXHIBIT: At the Marlboro Gallery at Prince Georges Community College in Maryland. 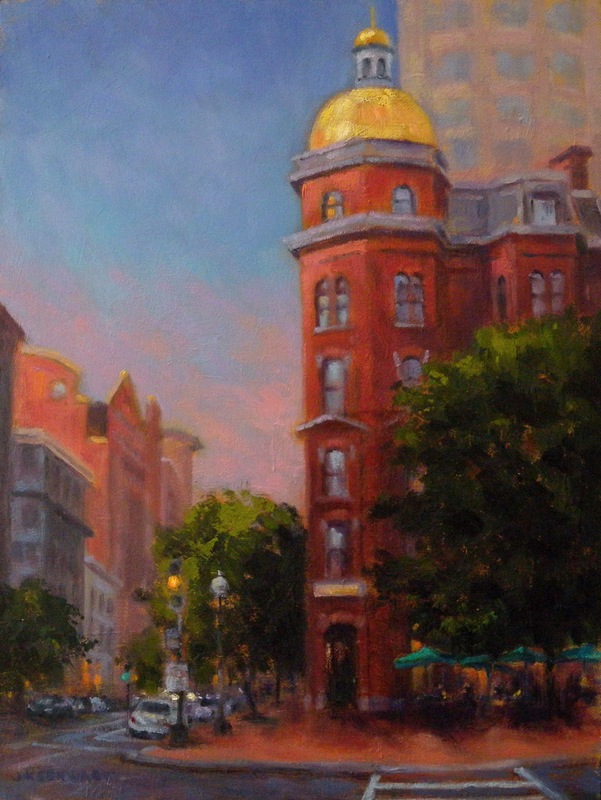 A Washington Society of Landscape Painters exhibit "Light and Shadow, the Energy of a Landscape" until September 21st. I have two large landscapes and one small one in this show.